We love biogas and apparently Stop & Shop does too, since its 212 New England supermarkets will be powering an anaerobic digester. Any excess food that can’t be donated – about 34,000 tons a year – will be turned into biogas – renewable natural gas that will power 40% of a 1.1 million square-foot distribution center. When fully operational, the anaerobic digester will produce 1.25 megawatts of electricity. Divert, Inc., which serves the local retail industry, owns and operates the biogas plant, made possible through a $400,000 grant from the Massachusetts Clean Energy Center. Policy helps too. Massachusetts banned major producers of food waste from sending it to landfills as part of its climate action plan. Any entity that generates at least one ton of organic material per week has to either donate or re-purpose useable food and send the rest to a biogas facility. Besides cutting methane emissions from food degrading in landfills, the ban supports more renewable energy in the state. New York City has a similar law, but it applies only to restaurants. This organic form of natural gas is being generated at landfills, wastewater treatment plants and dairy farms, reducing waste, eliminating methane emissions, and creating revenue streams. There are even biogas fueling stations. Kroger, the biggest supermarket chain in the US, has a biogas plant in California. 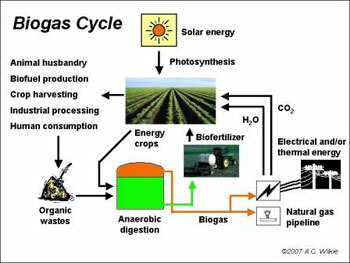 Read our article, Too Many Biogas Plants To Count, Growing Fast in US.